Following on from the findings in Benchmarking MicroLite 4.0 part 1 there are a few more things that are worth mentioning. The cost of params – we use the params keyword throughout the MicroLite codebase for convenience where there there are an unknown number of parameter values which could be passed to a method (which is exactly what the params keyword is for). This means for every call to a method with params signature, we require the allocation and garbage collection of an array even if there are no values to pass! Resulting Change – We have added method overloads without params or with additional fixed size args where we might not have any arguments or only 1. Lesson – Understand the implications of convenience and allow alternatives to avoid unnecessary object allocations/collections. Re-Generating the same SQL every time – in MicroLite 4.0, we were building the SQL statement every time we inserted/selected/updated/deleted/ an object, however thinking about this a bit more, the command text is always the same for a given class, only the values change per instance. Resulting Change – We have implemented a query cache per mapped type for each of the CRUD operations (INSERT, SELECT, UPDATE and DELETE) which are generated the first time the action is invoked for a given class. Lesson – DRY (don’t repeat yourself) can apply to the code executed inside a single method even if the code within that method is not duplicated elsewhere. Moving to generated MSIL – in MicroLite up to version 5.0 we were using reflection to get and set property values and although the approach evolved over time to be faster it’s still nowhere near as quick as the method would be if you coded it by hand. Resulting Change – We now generate a dynamic method at runtime by emitting the MSIL which would be produced to access the property. This entry was posted in Informational and tagged Performance on May 27, 2014 by trev. In the previous post MicroLite 5.0 – Performance Summary we gave an overview of the performance improvement between MicroLite 4.0 and MicroLite 5.0 and mentioned that we would drill into how some of those gains were achieved. In order to see what the cost of using the framework is, we need a benchmark. The one we built is available on GitHub MicroORM.Benchmark. We also need a profiling tool, fortunately YourKit have kindly provided an Open Source license for their excellent .NET Profiler. new HashSet<string>() – The reason we used the HashSet is that we get O(1) lookup performance rather than O(n) with a List. It turns out however for our purposes that the List is actually more performant. The reason for this is that the cost of creating a HashSet compared to the cost of creating a List is much higher. Also, it turns out that generally we have less than 15 items in the list so even with the O(n) cost of doing list.Contains() we still end up much better off. Resulting Change – replace HashSet with List. Lesson – don’t make assumptions about the performance of a piece of code without verifying those assumptions are true. ObjectInfo.For() – ObjectInfo is the class MicroLite uses to resolve the mapping details between a class and a table. The value is only created on the first call and then cached but we had a number of calls to ObjectInfo.For(instance.GetType()) throughout the code (5 separate resolutions per call to Insert). Resulting Change – Since the ObjectInfo is used by multiple classes in the call execution, we can resolve it once and pass the value through the call stack. Changed from 5 calls to ObjectInfo.For to 2 calls. Lesson – DRY (don’t repeat yourself) can apply to a single line of code if the result of that call can be passed to another class/method which needs it as a parameter. The reason for the TryLogDebug method is that if no logging library was registered, the log would be null so we created an extension method to verify that the log wasn’t null before calling it. The problem with this as it turns out is that the cost of resolving the resource message is incurred for every call regardless of whether a logger is actually specified or even cares about the level of the log statement. Nice one liners I’m sure you’ll agree & perfectly readable. There are however some “hidden” factors here, the lambda l => l... is created each time the method is called which incurs an object allocation (cheap) and extra work for the garbage collector to clean up after it (not so cheap). Also, an enumerator is created for the iteration of the foreach which again needs allocation and clean up. Lesson – avoid doing unnecessary work & nice code is not necessarily fast code. Now before you all count this as a needless micro optimisation, I’m not suggesting you go an revert back to for loop in your own code! However where performance is more critical then it can make a difference. For standard line of business code – the stuff we mostly write all day at work, stick with the lambdas & readability unless you can prove that the payoff is worth it. As you can see, MicroLite 5.0 introduces far less overhead in it’s use. This entry was posted in Informational and tagged Performance on May 23, 2014 by trev. We mentioned in the MicroLite 5.0 Released post that there has been some work internally in MicroLite to improve performance and reduce memory usage. We’ll dive into the details in future posts, but for now here’s a brief summary of some of the results. The calls are based upon a single instance of an entity, with the action performed 100 times inside an individual transaction each time. 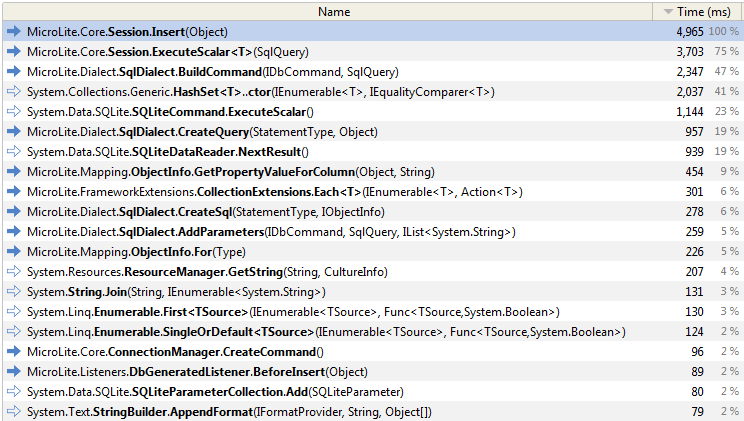 The following are based upon the above tests run in a profiler. This entry was posted in Informational and tagged Performance on May 12, 2014 by trev. Along with the release of MicroLite 5.0, we have added an extension to integrate with the StackExchange MiniProfiler. .Extensions() // If you are also using a logging extension, that should be loaded first. Version 1.0 of the extension configures MicroLite to use the profiled database commands, in future versions we may look to add additional timings for core MicroLite functionality. This entry was posted in Informational, Update and tagged Performance, Release on May 2, 2014 by trev. In .NET, strings are Unicode, however some databases have specific data types for strings which differentiate between ASCII and Unicode (e.g. 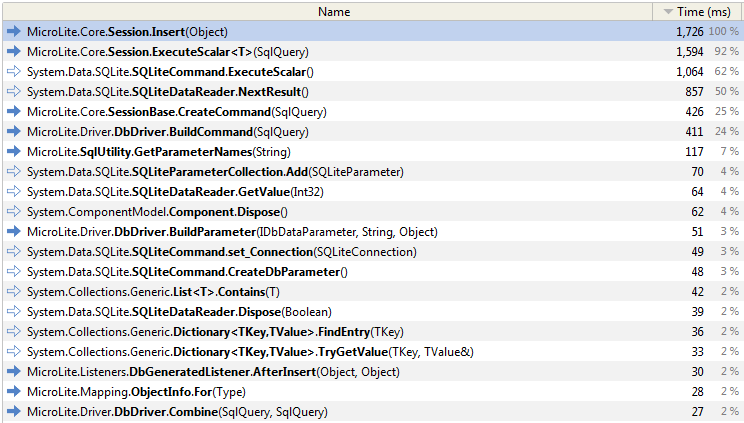 in MS SQL Server VarChar being ASCII and NVarChar being Unicode). If the database makes the distinction and the wrong type is used in a SQL command, it can result in poor performing queries (table scans over index lookups or unnecessary type conversion). In MicroLite 5.0, the database connection/command handling has been exposed via a ‘database driver’. The new IDbDriver interface defines a HandleStringsAsUnicode property which is set to true by default but allows explicit control over whether strings are sent to the database as ASCII or Unicode (the default). If you use MS SQL Server and the columns are NVarChar, HandleStringsAsUnicode should be left as true (the default value). If they are VarChar, HandleStringsAsUnicode should be set to false. For other databases, refer to the documentation and if in doubt, leave it set to true. // Only change this if you are sure you need to. This entry was posted in Informational, Tutorial, Update and tagged Configuration, Performance, Release on April 24, 2014 by trev.